Dr. Warong invited me yesterday to meet the director of Wat Tamaprang Municipal School. So at 9 am today, we met the school director, the deputy director and the head of the English department. 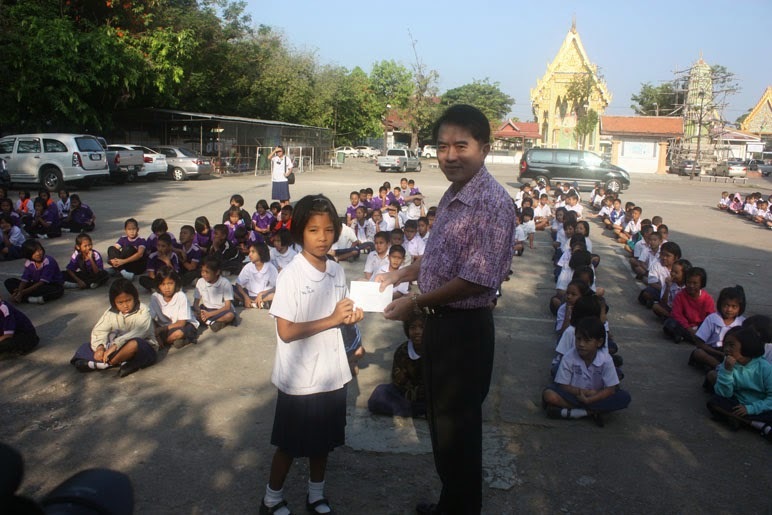 The school director was so pleased because his school, among the many temple schools in Phitsanulok, was chosen as the venue for the pilot project of teaching the kindergarten students. The duration of the project was originally planned for only three months. The school director however suggested to finish the whole term and teach for four months. Everyone agreed. The date was also been confirmed to start on the 1st of November. We will spare 2 hours of our time everyday – so that’s 10 hours a week, and about 40 hours a month. Some members of the Democrat Party including former Finance Minister Korn Chatikavanij could possibly observe the first week of the project if time permits. I later learned that Khun Korn was a really big name in the Democrat Party who handled a lot of big projects during the Abhisit Vejjajiva’s term as the country’s premiere. It is going to be a really big challenge, so to speak, because classes are going to be recorded on video on its first week. Then from time to time, probably unannounced, they might come again to record the progress of the students. And on the last week of the project, they will surely come again to compare whether there are progress, or none at all. LoL. It will then be determined whether the project is successful or a big time failure.